Would you like to have lovely green grass in your home but the thought of waiting years for it to grow is too long? Hurry the process along and get Abbey Turf to lay beautiful instant green grass turf in your home. We are the number one leading provider of turf in the Portsmouth area. Finding turf that is of a high standard can be a quite tricky achievement in the UK. However, at Abbey Turf, we sell, deliver and install the freshest Portsmouth turf that is completely weed-free to your property. When you want the highest-quality green grass turf Portsmouth products for your building, Abbey Turf will definitely deliver. 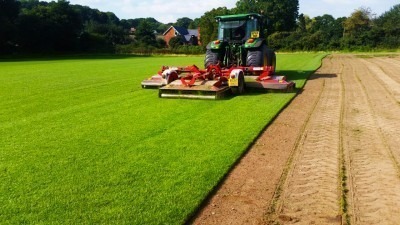 To create our first-class turf Portsmouth grass, we make sure to only use the very best turf seeds on the market. Our turf seeds are planted into the finest sandy soils to ensure that it develops healthily. To guarantee that we create the most excellent turf Portsmouth harvest, we never, ever use weed treatments on our turf, and there is never any netting that could stump the development process covering our turf. We grow your turf Portsmouth crops on our plot site of 180 acres, and we have a constant ongoing repetitive cycle of turf growing, so we always have turf that is ready for your requirements. This constant source allows to up promise that we will get your turf order to your within 24 hours of your request. Our team then gently harvest your newly grown turf, and load it into one of our industrial strength for trucks to personally deliver your delightful new turf to your Portsmouth home. In addition to providing excellent quality turf Portsmouth services, our company also specialises in supplying as much mulch, top soil and as many bark chips that you can possibly need. We have installed beautiful Portsmouth turf to businesses, schools, Local Authorities and Governments, so you can be confident you are in good green-fingers when you select Abbey Turf for your turf manufacturing company. See how our team have transformed gardens in Portsmouth over the years with our lovely green turf, by viewing our gallery. Make the exterior of your property look attractive and welcoming, by having Abbey Turf install luscious turf. Portsmouth homes and commercial sites look hundred times better with our expertly crafted turf Portsmouth service. Call a member of Abbey Turf today on 02380 812302 to begin the process of getting luxurious lawn on your property today.